As with many classes I’ve taken, our teacher, Lanakila Mangauil, stuffed as much as possible into the final weeks. 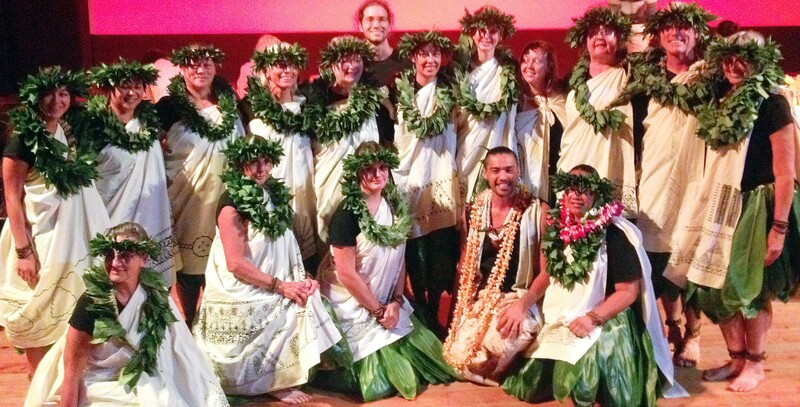 On the last day, we learned one last hula – the one to exit the stage. My favorite is a happy dance where we call on Laka, the goddess of hula. The innovation in this particular hula is that we danced backwards in a circle to a 1-2-3 beat. Nothing Ginger Rogers didn’t accomplish with Fred Astaire in a waltz, except that we had to learn arm motions as well as foot steps. I only trip up (sometime literally) when the arms are swinging one way while the feet are going the other. Oh, and we chanted it, too. I also loved the Pele chant. During our endless practices, my classmates voted my “devouring the earth” face the fiercest, probably because I never really mind looking strange. We are supposed to look and feel (hot) like Pele making new land. It works. My glasses always fog up by the end of this hula. But the practice and the performance weren’t the most intense parts of the ho‘ike. No, that honor goes to all the adornment we had to make just days before the event: a ti leaf skirt, a kihei (a cloak of white muslin printed with a personal design using the class as inspiration), new kupe‘e (ankle and wrist braids), lei po‘o (ti head lei), and neck lei with kukui leaves. The kupe‘e could be made ahead of time, because the brown ti materials are dead to begin with – there was no chance of them going bad by the time of the ho‘ike. Likewise the kihei, though we didn’t learn about it in class until near the end. I had to tease Lanakila – after all his talk about getting back to the old traditions, he instructed us to use latex paint to apply the design, though our “paintbrush” was a ti leaf cross-section used as a stamp. Thank God, Julia set up a kihei stamping station at her house and I could avoid that mess at mine. But the other items had to be made fresh. 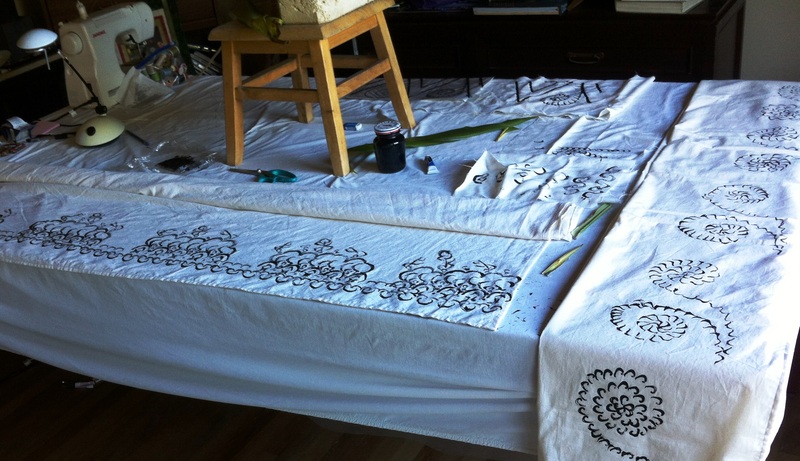 The most fun and labor intensive project was the ti leaf skirt. As with our other ti projects for this class, I supplied ti leaves to three other classmates. We took down five large multi-limbed ti plants to provide the 600 or so leaves needed. When I say large, I’m talking 20 feet tall. Now I’m trying to find homes for all the ti limbs lying in my driveway. 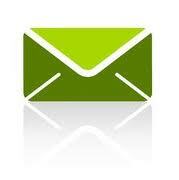 Need any? They transplant easily. Then we washed the leaves (didn’t want any little spiders to make their way to our thighs while dancing), sorted them into different sizes (luckily we were all different heights and needed different sized leaves), deboned them, and then trimmed them one of two ways so that they were all exactly the same size and hung the same length and any brown ends were removed. Prepping for hula is all about being persnickety. 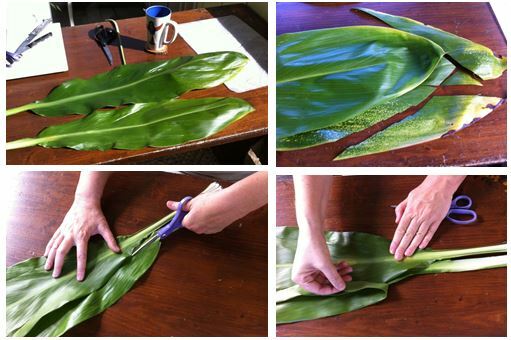 We employed haku, the second lei making method learned in class, to create our lei po‘o. It’s a standard three strand braid using brown ti leaves, but adding cut green ti in diamond shapes at every crossover point. Mine turned out pretty good. It is worn straight across the brow, never perched upward like the Statue of Liberty. 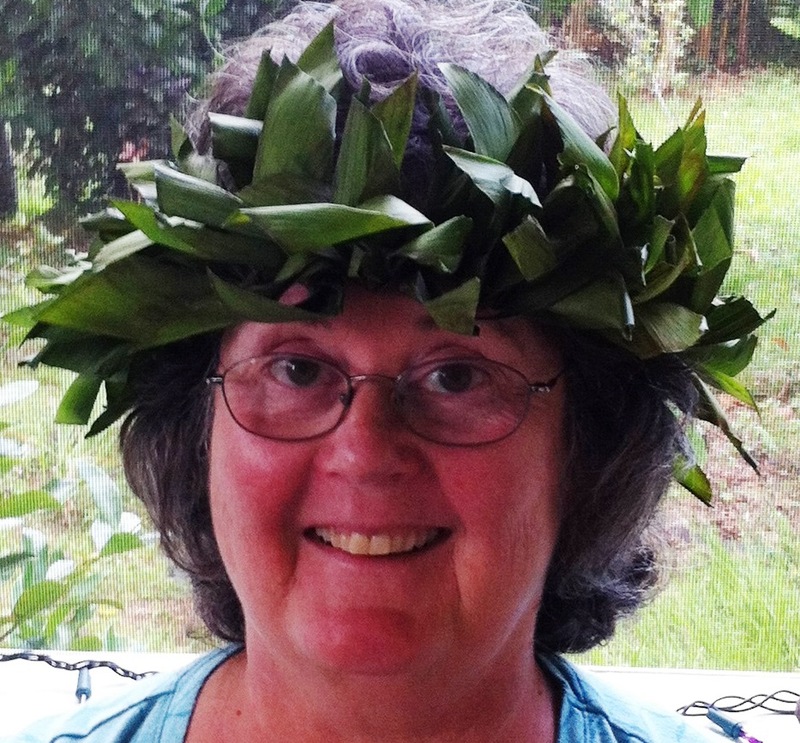 And then there was the kukui leaf neck lei. 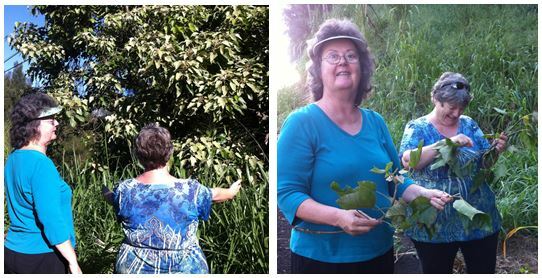 Early the morning of the ho‘ike, Julia and I went back to Kukuihaele to harvest leaves. 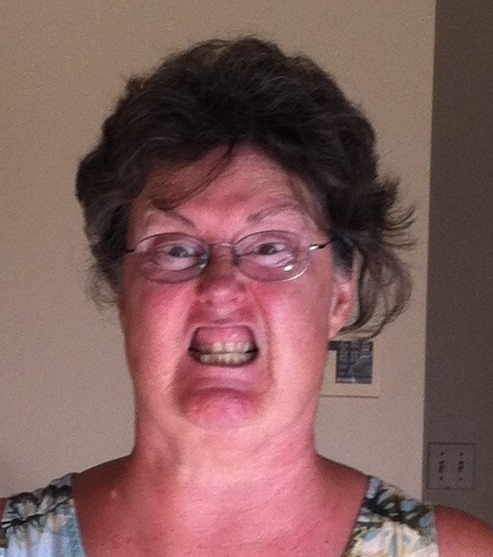 (See Prepping for our ho‘ike – no time to let my J droop.) 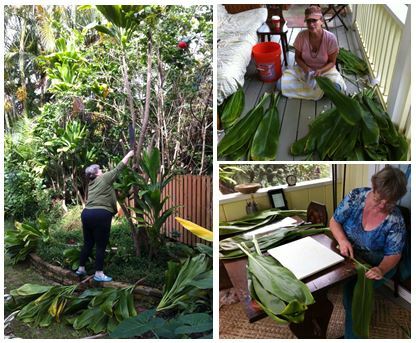 We chanted for permission, harvested leaves at three spots (even with the lopper the branches were too far away), stripped the leaves off, brought them home, washed them, and only then started weaving them into the lei with the third method we learned, wili, a wrapping process using a deboned ti leaf as the base and raffia to hold the tri-folded kukui leaves on. I don’t know what I did wrong, but by the end of the night, my kukui leaves were falling out. Maybe I didn’t chant sincerely enough. Shades of Linus and the Great Pumpkin! After all that, I came away with a strong appreciation for hula dancers who compete in events like the Merrie Monarch Festival. Dancing is only a part of their effort. Anyway, now we can rest. It is the season of the Makahiki. Lanakila’s next class doesn’t start until the dry season begins in the spring. I’ll be there. This entry was posted in Chants and blessings, Hawaiian Culture Class - Lanakila Mangauil, hula, island culture, learnng new things, Personal growth, plants in my yard, Resurgence of Hawaiian Culture and tagged honoring Hawaiian culture, Lanakila Mangauil, making a ti leaf hula skirt, stamping a keihe. Bookmark the permalink. Thank you, Marilyn. An A for effort and hutzpah, certainly. As for hula technique, “they” say it takes about seven years to get good.